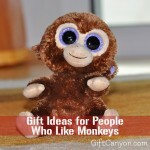 Home » Blog » My Favorite Things » Animals » 12 Fantastic Giraffe Gifts for Giraffe Lovers! 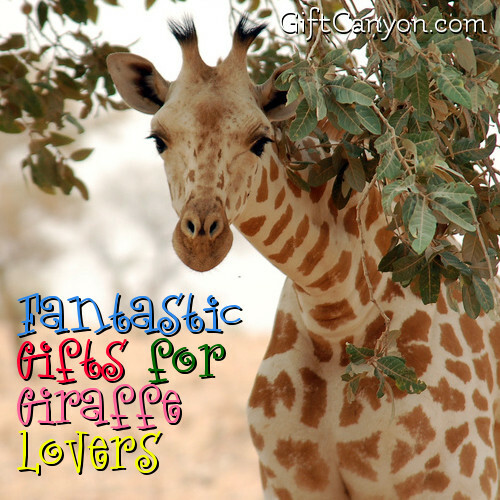 12 Fantastic Giraffe Gifts for Giraffe Lovers! Whenever you say the word giraffe, the first thing that comes into your mind is the gracious long neck of this creature. Giraffes are used symbolically to tell us to stick our necks out, stretch our horizons and encourages us to be the best version of ourselves. Giraffe’s long neck may also mean visualizing a long reaching goal no matter how grandiose it is. Giraffe people are known to see the big picture in every circumstance and have the knack for trends. The giraffe also symbolizes perception and insights. If you are a giraffe person or someone close to your heart is one then you should check out our twelve great giraffe gifts that feature the majestic giraffe. 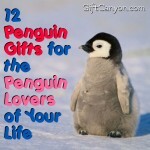 Gifts can be something that someone wishes to have for a very long time. 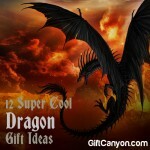 It can also be something that they can use at home and would be delighted to receive. 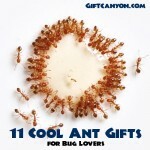 Home items are great gift ideas since these are economical and useful too. 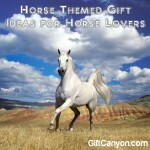 Check out our giraffe gift items that are ideal for your home from the list below. Giraffes are not only known for their beautiful long necks but they are also known for having great facial features. If you are in love with this majestic creature’s face or knows someone who adores a giraffe then this giraffe cushion cover would be a great gift idea! 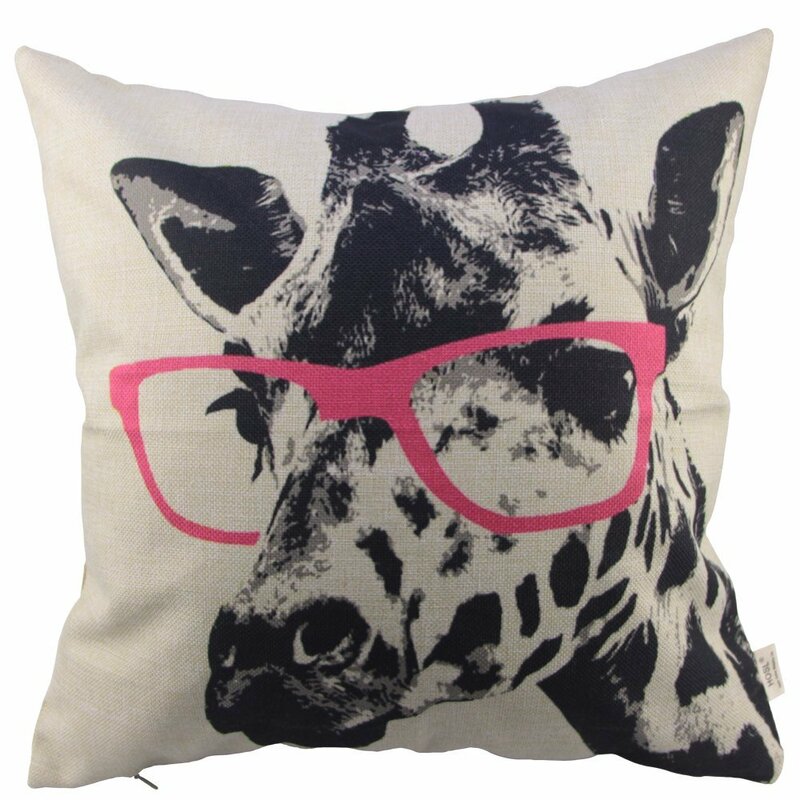 This giraffe cushion cover features the face of the giraffe with a very cute pink glasses as an added attraction. This cushion cover can fit a throw pillow which measures 18 inches by 18. It is made from cotton which makes it smooth and comfy to touch. This would be a stunner in your couch or even in your office seat. 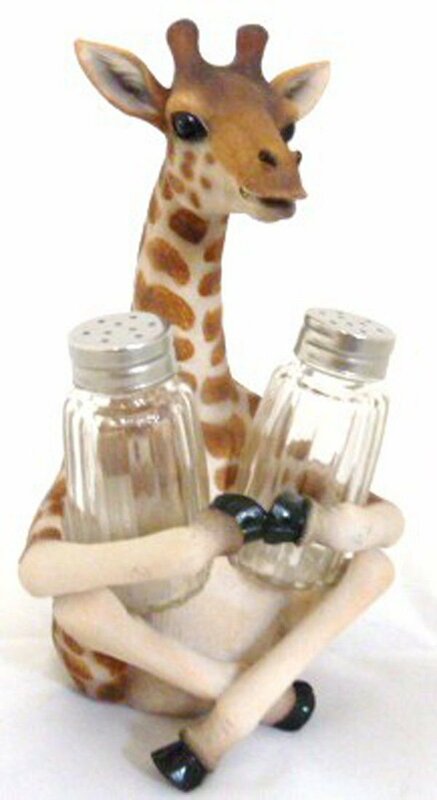 Any kitchen would standout when this giraffe salt and pepper holder would grace one’s kitchen counter. This one of a kind salt and pepper holder features a sitting giraffe comfortably hugging the great kitchen tandem salt and pepper. 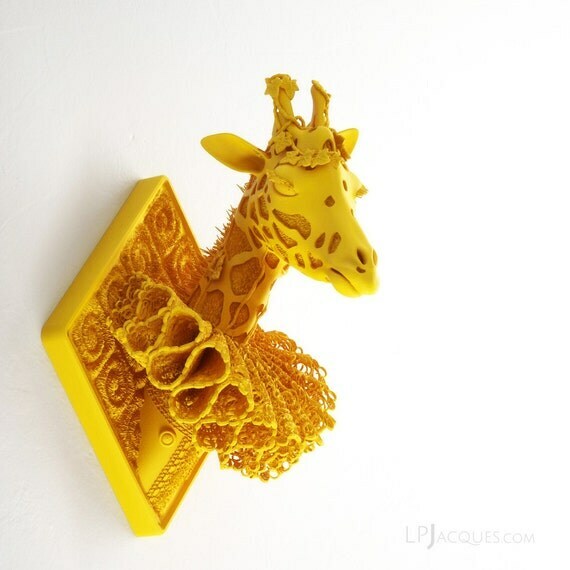 The giraffe figurine is made from premium cold cast poly resin. The design is painted and polished by hands which is evident from its intricate details and beauty. 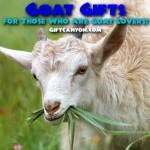 Useful Giraffe Gifts for Those Who Love Giraffes! Coffee mugs are usual gifts for the coffee lovers but this giraffe coffee mug is one of a kind because there is an impending surprise at the end. A baby giraffe would be happy to greet you once you get to finish your drink from this mug. 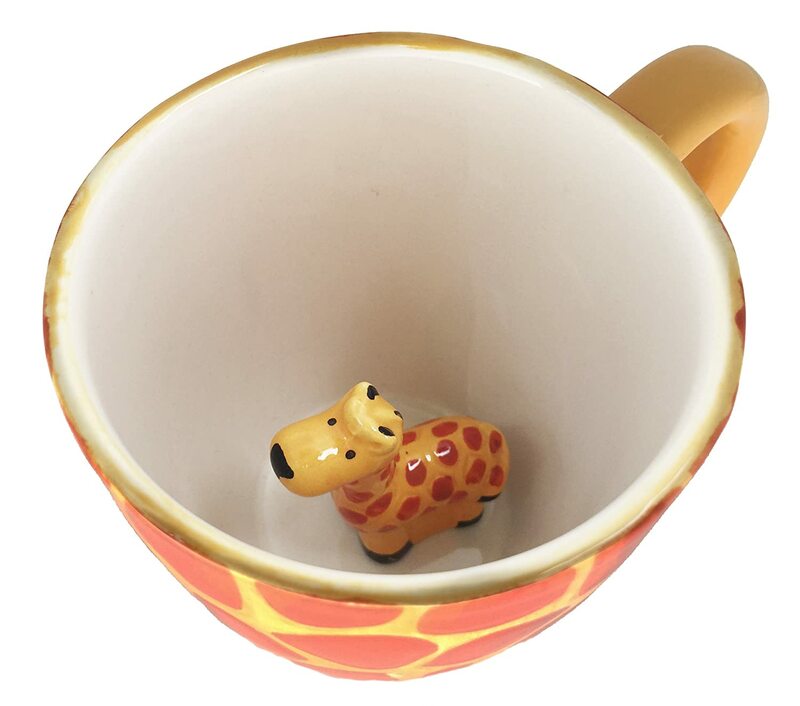 Play peak a boo with this baby giraffe in this cute novelty coffee mug. 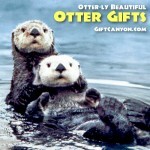 This would be a great gag gift for kids and the young at heart. This giraffe novelty mug is dishwasher safe but handwashing it is preferred. The giraffe’s head is so beautiful that some people would like to have it in their homes to add some beauty to their walls. Killing this creature is so unruly but your fantasy of having a giraffe’s head in your living room would come to life through this giraffe wall sculpture. This is a majestic creation that is made from soft touch polyamide matte that gives a great impression of the beautiful head of a giraffe. Having this giraffe sculpture would bring beauty to your living room without harming any giraffe at all! The detailed design of this wall sculpture is so refined that would make anyone in awe when they get to see this at your home! 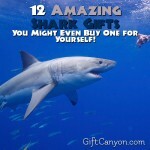 Kids are one of the major recipients of gifts in whatever occasion there may be, it maybe during the holiday season or on their birthday. Kids love to play with toys to make use of their energy and idle time. If giraffe is their favorite animal in the whole wide world then you need to check out these giraffe toys from our fine selection below for your reference. Toddlers are fond of playing and everything amazes them especially if there is a toy that is huge and fun to play with. 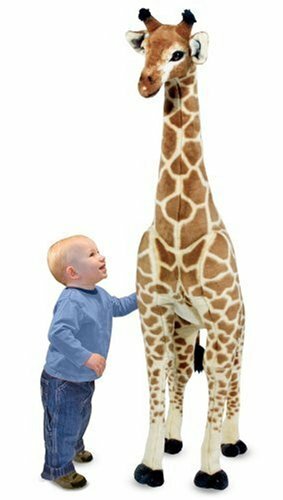 This life like huge giraffe plush is a great gift idea for your adorable toddler. This huge giraffe plush is hand crafted to perfection. The intricate details on this giraffe plush would astonish any toddler there is. This huge giraffe plush toy stands proudly at nearly five feet tall which could instantly turn a kid’s room into a safari! If you are gifting someone who is barely a year old and you want to gift a toy that would be useful as well then why not gift this vulli Sophie la giraffe. This giraffe toy is a safe teething toy for those kids who are just starting to have some baby teeth erupted. The materials of this giraffe toy are made from food paint and natural rubber which assures any mom out there that their child is safe to chew on this toy. This giraffe toy is BPA and phthalates free which makes it safe for kids. This giraffe toy is handmade and is designed with specific details of a giraffe. 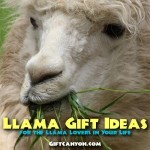 Awesome Gift for Giraffe Lovers! 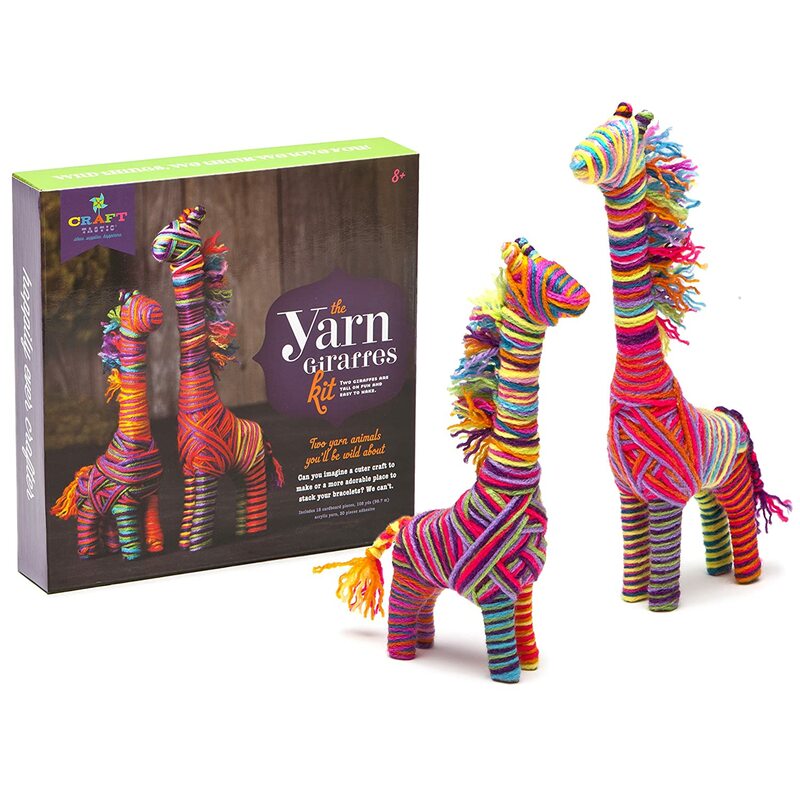 For the crafty kids on your list, this yarns giraffe kit would be the perfect gift! This craft kit includes 108 yards of yarn made of acrylic, 18 cardboard pieces and 30 adhesives. The child would have tons of fun hours making tall giraffe that can measure up to a feet tall by wrapping colorful yarns. Toys are not just meant to be played with, they can also be a learning tool. Check out this wooden alphabet giraffe. 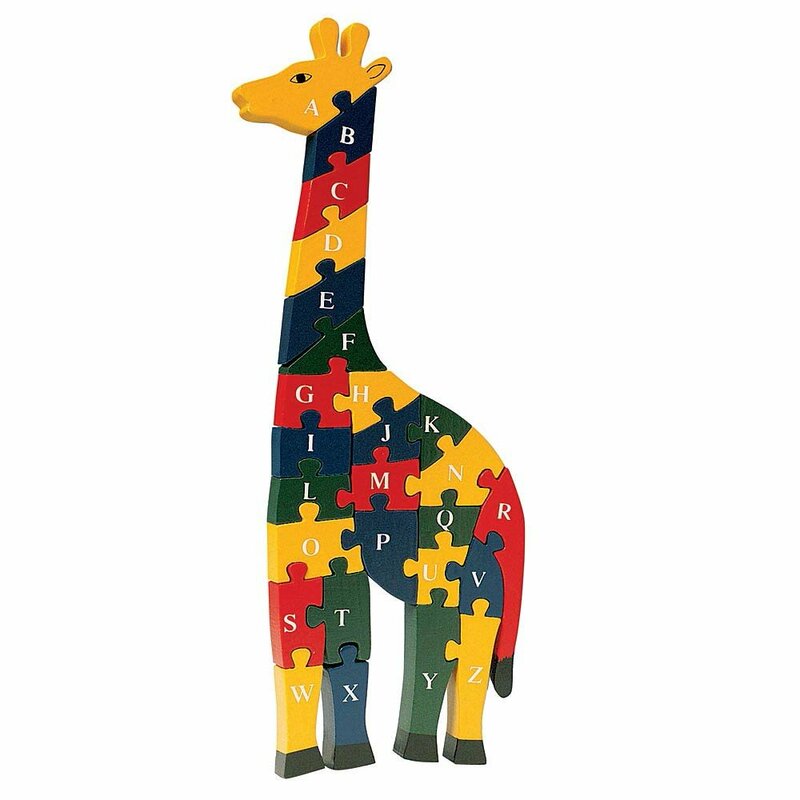 This wooden alphabet giraffe measures 16 inches tall and is made from non-toxic material. Playing with this wooden alphabet giraffe can encourage a child to develop fine motor skills. Numbers and alphabet can be learned in a fun and colorful way through this wooden alphabet giraffe. Jewelries add some shine to your usual outfit. It may be a pair of earrings, bracelet or necklace but either way these giraffe jewelries will stun you and brighten up your wardrobe. Simplicity is beauty. 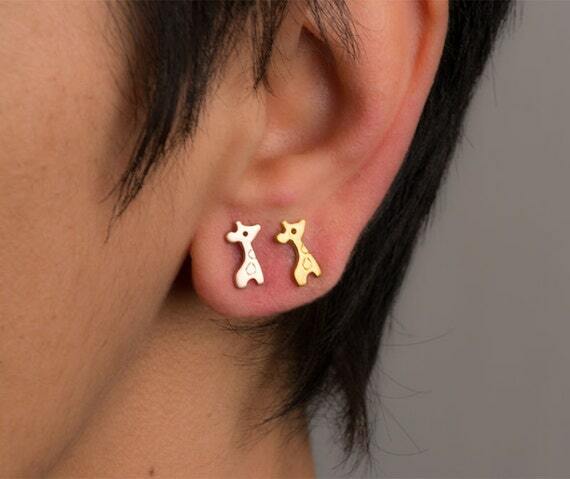 You can tell from the mere sight of these giraffe stud earrings that simple is attractive. This pair of stud earrings is made from sterling silver which measures 7mm by 10mm. You can wear this on a daily basis and even on a semi-formal occasion. 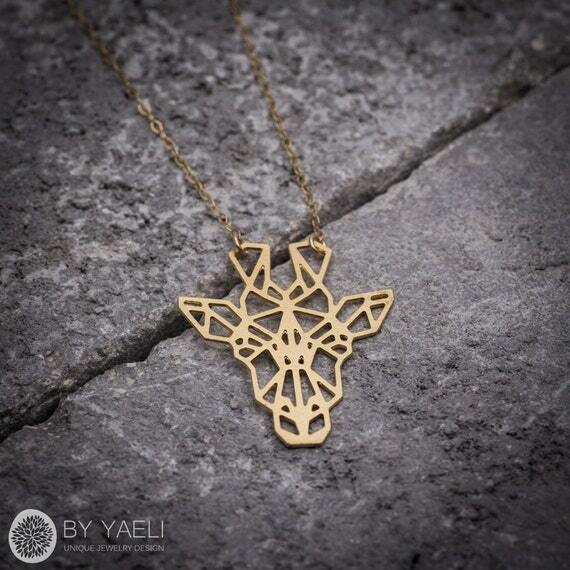 If geometric animals are your thing then this geometric giraffe necklace will rock your world. This giraffe necklace is made from high quality brass that is 18k gold plated. This can be worn in almost any occasion there may be because it has the majestic beauty and charm of a giraffe captured in this necklace. Beautiful Giraffe Jewelry Gift You Can Give to Almost Anyone! The baby giraffe is a cute animal that makes this ring band one of a kind. This ring is a one size fits all ring band. 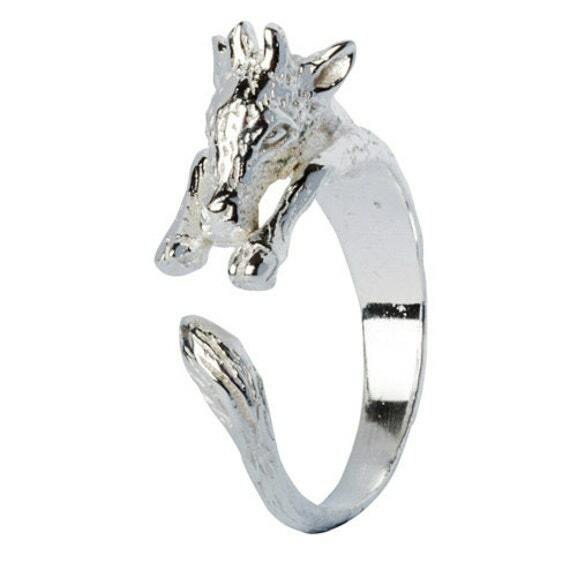 If you would like to surprise someone with a unique jewelry why not gift this baby giraffe ring. The giraffe is known for its long and gracious neck. If you know someone who has a long and beautiful neck to flaunt just like a giraffe then this personalized giraffe necklace would be a surefire hit! 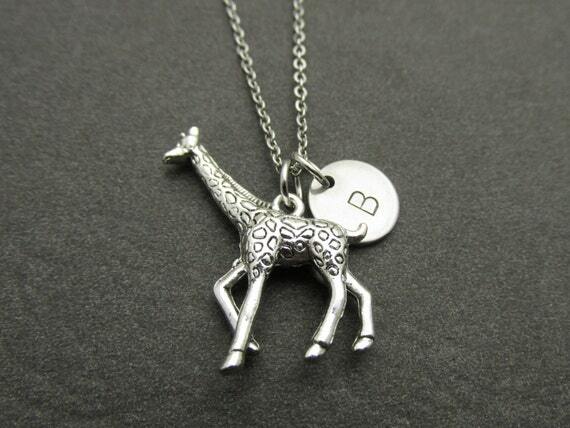 This necklace has a three dimensional giraffe with a monogram of the initial of your recipient’s name. The stainless steel chain runs up to twenty inches long while the three dimensional pendant measures 27 mm by 22 mm. You can be captivated by the intricate details of the giraffe on this necklace. 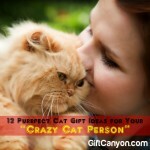 This would be a perfect fashion accessory that would certainly be a conversation starter wherever you go. 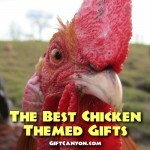 Can You Suggest More Giraffe Gifts? Chime in the comments below.